As we begin our 7th year of publishing Playset Magazine, America's best and only publication devoted to vintage plastics, it's back to the Atomic Era of space, rockets and men-of-science! 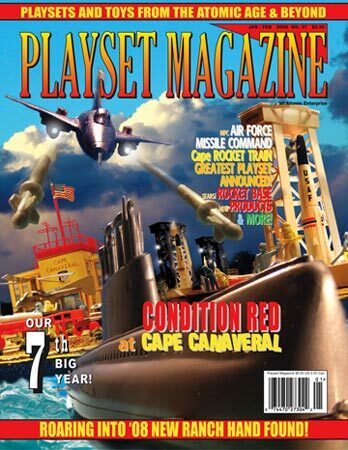 Playset Magazine blasts you into the great stellar regions of space! Get your Retro Rockets ready, folks, because here's a set with loads of surprises, even if you think you know it! Headlining the rare exploding submarine, the No. 5935 Sears Deluxe Cape Canaveral was the flagship of its day with many unusual and deluxe features, sure to appeal to the most knowledgeable collector as well as the novice! Our featured set is surrounded with rarities and treasures, from the behemoth and battery powered Sears Rocket Base (this one has a convex mirror in the launch pad to simulate a fiery blast-off! ), to a blister carded set or two, to the rare MPC (that's right, MPC!) US Air Force Missile Command -- with tin litho building and complete radar accessories! But that's just the beginning! We have the inside scoop on a new discovery - the 15th Ranch Kid has been discovered and confirmed! Next, how about some details on quite possibly the rarest of Marx train sets -- The Cape Canaveral Express -- you've no doubt heard of it, maybe even had a few of the parts, but we've got the contents right here for first-time ever coverage. What a way to begin our lucky 7th year of publishing! And would you believe it? There's still more as we prepare this first-ever Cape issue for you. While you are waiting, remember this is a prime time to renew your subscription, if you haven't already.